Gatwick to Liverpool Street Station Taxi – Gatwick to Liverpool Street Station Taxi – Book Gatwick to Liverpool Street Station Taxi, Gatwick Airport to Liverpool Street Station Taxi & Get 10% off! : London Liverpool Street or Liverpool Street Station is one of the most famous railway stations in the British Capital. It represents a railway terminus located in Central London and it is also linked to an Underground station that is also situated in City of London. The West Anglia Main Line that goes to Cambridge ends at Liverpool Street. It also serves the Stansted Express that travels to Stansted Airport, various local commuter services to Hertfordshire, Essex and east London and Great Eastern Main Line that goes all the way to Norwich. The Liverpool Street Station dates from 1874 and it replaced the Bishopsgate station. In 1917, during the First World War, Liverpool Street was hit by a bomber aircraft. It was the city’s first site to be bombed. From 1985 to 1992, the station was modernised and improved and in December 1991, it was opened by the very Queen Elizabeth II. In the last couple of years, Liverpool Street Station featured no less than 57 million passengers. This includes it among the busiest railway stations in the country. Also, following Victoria and Waterloo, it is the third busiest station in the Capital. Network Rail is the manager of the station. This great station has three exits: one to Bishopsgate, one to Liverpool Street and the last one to Broadgate development. The Underground station with the same name connects the following lines: Metropolitan, Hammersmith and City, Circle and Central. Liverpool Street is located in fare zone 1. So as to get rail transport from Gatwick Airport to Liverpool Street Station, you will need to take the Bus to Victoria Underground Station, then the Tube to Liverpool Street and afterwards walk to Liverpool Street Station. Also, you can choose to take a taxi from Gatwick Airport to Liverpool Street Station. In order to travel by car from Gatwick Airport to Liverpool Street, you should take the M23 and the A23 roads. Gatwick Airport is 28.4 miles away from Liverpool Street Station. A Gatwick Taxi to Liverpool Street Station with 247 Gatwick Airport Transfer will last approximately 1 hour and 23 minutes. 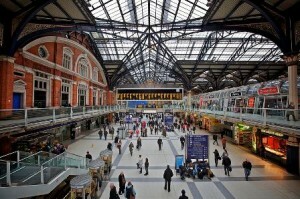 The price for a London Gatwick Transfer to Liverpool Street Station will be around 58 GBP.